The current injector is one of the most versatile of the injector products. Load Stepping, Non-invasive phase margin. Coupled with the G5100A, or other equivalent function generator, it is capable of performing small signal load steps up to 40MHz, with very fast rising and falling edges. Using the G5100A, also allows the rise and fall times to be controlled, various waveforms or even arbitrary waveforms. This can be used to simulate the effects of many different types of loads, including high speed digital circuit loading, which is often largely dynamic. The current injector can also be used to measure output impedance of power supplies, voltage regulators, power buses and even batteries. It can be used to non-invasively measure the stability of a combined input filter and the negative resistance of a switching power supply. It also has application in the measurement and extraction of transistor data, including small signal current gain, Ft and many other dynamic performance parameters. In RF and instrumentation circuits it can be used to provide constant current biasing for class A amplifiers and buffers. Measuring Output Impedance The current injector has two connections for the output, Output and GND. The input is DC+AC and can be connected to either a signal generator or a network analyzer (see the Bode 100.) A built in bias current enables Class A operation for use with a network analyzer. The Current Injector and DC Bias injector can also be used for this purpose. 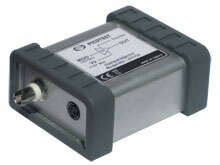 The output current is reduced 40dB from the input signal, resulting in 10mA/V scaling. The current monitor is designed to be terminated into 50 Ohms and can be used with the network analyzer, an oscilloscope or a DMM to monitor current. When used in conjunction with a voltage probe, the analyzer can measure Voltage/Current, which is the impedance.